Gracie has a home! - Rocky Mountain Great Dane Rescue, Inc.
Gracie has a home with her foster family in Denver , CO. This will be the second time Joseph and Lauren have Foster Failed with us! 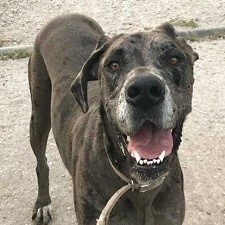 They recently lost their sweet boy, Norman (previously Sinatra) whom they adopted 2 years ago, and are ready to fill their home with another Great Dane. Gracie will have a Boxer mix and two cats to play with in her new huge back yard, as well as enjoy camping trips and long walks.The family has affectionately renamed her Emma. Way to go sweet girl!